We just celebrated Earth Day on April 22, an annual fête of huge importance for those of us wanting to increase the public’s awareness of the challenge of climate change, and our substantial human contribution to it, and ways we might fight it. It’s an important time for us in another way, too, as this yearly outpouring of Green advocacy transcending borders buoys up our enthusiasm, telling us we’re not alone in our caring. After all, sometimes it seems that we’re on this great big mountain we impulsively thought we could climb; so rituals of solidarity like Earth Day give us pause to catch our breath, reassess, and press on to our worthy goal of a humanity in harmony with nature as one species among others, each necessary to all. Just maybe we can pull this thing off. Anyway, good to dream big rather than live small. The truth is that so much more needs to be done and that we’ve been moving at a snail’s pace in making climate change a palpable issue for the public. I saw this demonstrated all too clearly in the presidential debates in 2012, or just 18 months ago, with not a single question directed to environmental matters raised by debate moderators. If the press can seemingly have no feel for the greatest issue ever to menace us with its destructive pay-load should we evade addressing it, then how much less can we expect the public to grasp what’s at stake? As is, individual lifestyle changes like driving less, getting rid of plastic, cutting back on electricity in our homes aren’t going to do the trick. We need more than bandages to treat the Earth’s hemorrhaging. Now consider that a recent poll suggests that 37% of Americans don’t even believe in climate change. There exist also a good many, perhaps even more, who look at climate change as simply cyclic and that, just maybe, it might even right itself. Of course that view gets us off the hook and we can conduct business as usual. Just recently the United Nations released the findings of its Intergovernmental Panel on Climate Change, a careful study by credentialed scientists encompassing some 40 volumes. Insiders say they toned down some of their language and projections so as not to unduly frighten, though their findings still emerge as deeply sobering, with none of us escaping vulnerability to what surely are predictions on an apocalyptic scale. In all honesty, I haven’t noticed any work-up by media or any concerted effort by members of Congress to hold hearings on the report and what we might do to save the day. Like many of you, I grow weary–and wary–of their feckless accommodations to corporate interests. What’s vital is that we impact the political process, as happened with the Vietnam War, ultimately culminating in LBJ’s decision not to pursue reelection. It started with just a few protesters, then took hold and proved unstoppable. Unfortunately, I don’t see anything like this breaking out. I think this is because many of our projections for climate change impacting us lie still in the future, whereas flag covered body bags coming into Dover AFB were a daily, tangible occurrence, which the media ultimately caught up with when it perceived a muscular protest movement, packing a punch, that wasn’t going to go away. On the other hand, if we haven’t been able to muster cadres of protestors against our Iraq and Afghanistan incursions with their costly toll in life and wounded for a dubious cause, how much less likely for an environmental movement devoid of blood and gore? And that’s what makes climate warming so horrendously insidious, or like some invisible killer we know is out there, but don’t know where he is, or when he’ll strike, or how. Perhaps our young people will again show us the way as they did with Vietnam by way of their fossil fuel divestment sit-ins sweeping our college campuses, some 300 as I write, with several success stories, including Harvard with its $32 billion endowment. If it’s wrong to destroy our planet, it follows we shouldn’t be seeking to profit from those who do. I wrote earlier of the Vietnam days when students rallied to make a difference. All of us: unions, retirees, teachers, tech workers, etc., might do well to follow their lead in choosing our retirement portfolios more discriminately. 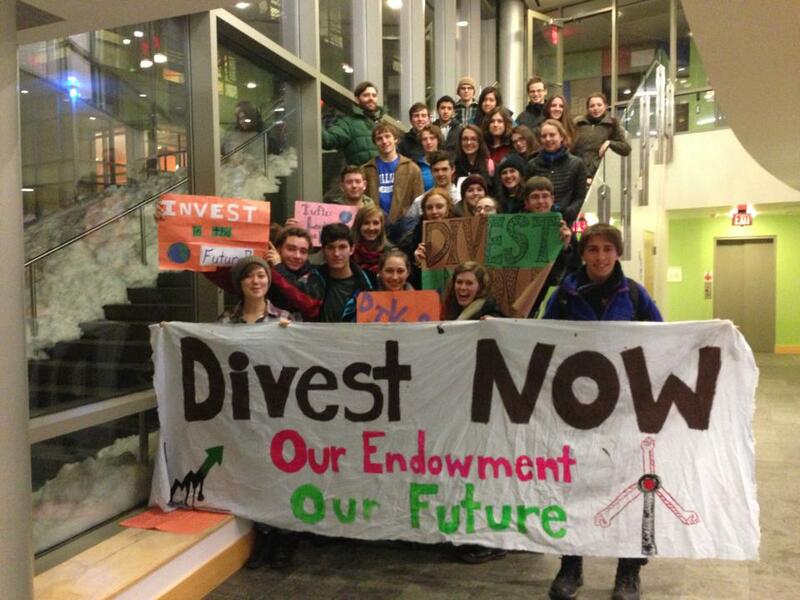 But divestment has its limitations, too. While it was practiced widely in the 70’s and 80’s to pressure South Africa’s apartheid regime, the invariable result was that other investors stepped in. It’s true value lay in shaping public discourse, and I venture this holds true with this present endeavor. Still, I question the wisdom of painting with a broad brush the fossil fuel industry as some kind of axis of evil. We need energy. Are our students willing to follow through and divest themselves of their cars and their electricity and take on an Amish likeness? We would do better to focus on the coal sector, our greatest polluter. I still like our president–articulate in his efforts to assure health care access, social and economic equality, tax, immigration and drug sentencing reform. So far, he’s championed alternative energy efforts, sought restrictions on coal burning power plants, held out against the Keystone XL project, endorsed alternative energy efforts. As for Keystone, he needs our support even as we must sustain, and grow our protests, to keep a fire under his feet. When I think of Keystone and the big money behind it–think Koch brothers–I get nauseous: the obscenity of it, given the perils of climate change; the stench of it, given its association with pet coke; the callowness of it, given its destruction of farmland, water aquifers, and wildlife habitat. If it came down to, say, an errant asteroid making its way to befuddle our planet as once happened, plunging the world into a rebirth of its pre-evolutionary darkness, then you can bet your life we’d all get off our bottoms and fight the good fight. Well, think of that asteroid as climate change. This entry was posted in Environment, People, Politics, Reflections and tagged climate, climate change, divestment, environment, fossil fuel divestment, Gary Peters, Global Warming, Harvard University, Intergovernmental Panel on Climate Change, Keystone XL, Koch brothers, Obama, Sierra Club, sit-ins, Vietnam. Bookmark the permalink. 1 Response to Climate Change: Can we win the fight?